It’s the season of love! Well, hopefully every season is a season of love if we’re doing it right :), but as we head toward Valentine’s Day, I thought I’d show you a card and a pretty pillow box I created with a couple of sets from Power Poppy. 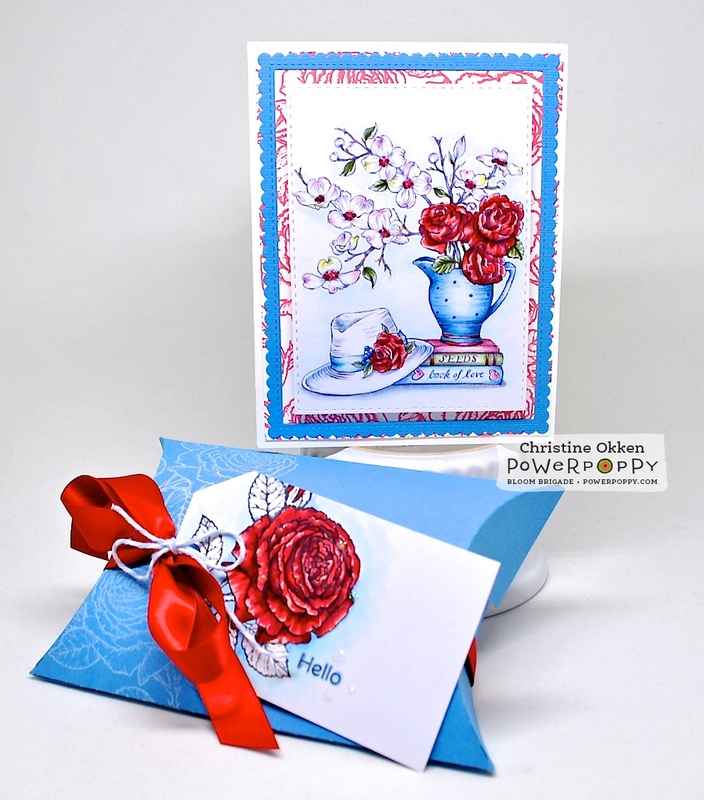 For the gift box design I used My English Rose Stamp Set and then for the card I used Graceful Still Life Digital both from Power Poppy. You’ve just got to love the beauty of a rich red rose. I’ve paired it with a pretty shade of blue to give it some contrast. For the main image on the card I printed the digital in a lighter gray so that it would have some softness and then added the colouring with some Copics. 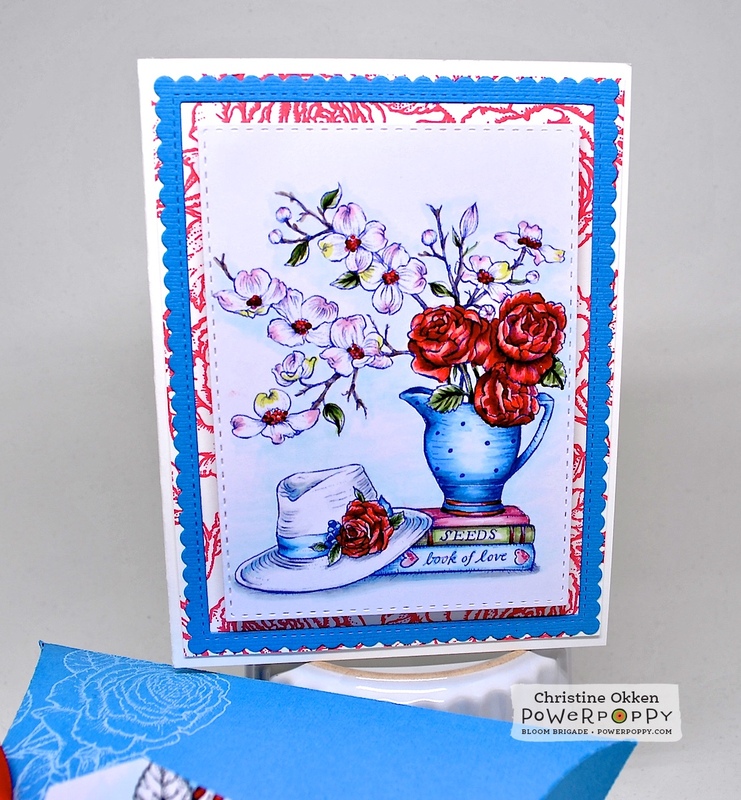 In the background I stamped the larger rose from My English Rose in red so you get just a peek of it. For the pillow box I used a Silhouette file and my Silhouette Cameo to cut out blue cardstock in the shape of the pillow box. I like using the Cameo for this type of thing because it cuts tiny lines where your folding should be and it makes it really easy to fold. Before putting the box together I stamped the rose from the set in white craft ink over the left side of the box. 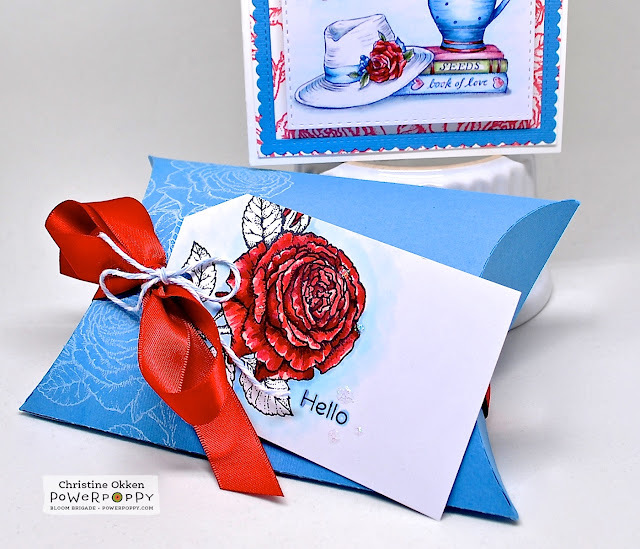 Next I created a tag with the rose from the set and just coloured in the petals and the background, adding a few Nuvo iridescent dots for a bit of sparkle, and then a pretty red satin ribbon and a bit of blue twine. Ready for Valentine gift giving! Have you played along yet in our Power & Spark challenge for February? It’s all about love and sparkle! We'd love to see what you can make with either a Love theme or a Sparkle theme or combine them into a card that shows off BOTH! 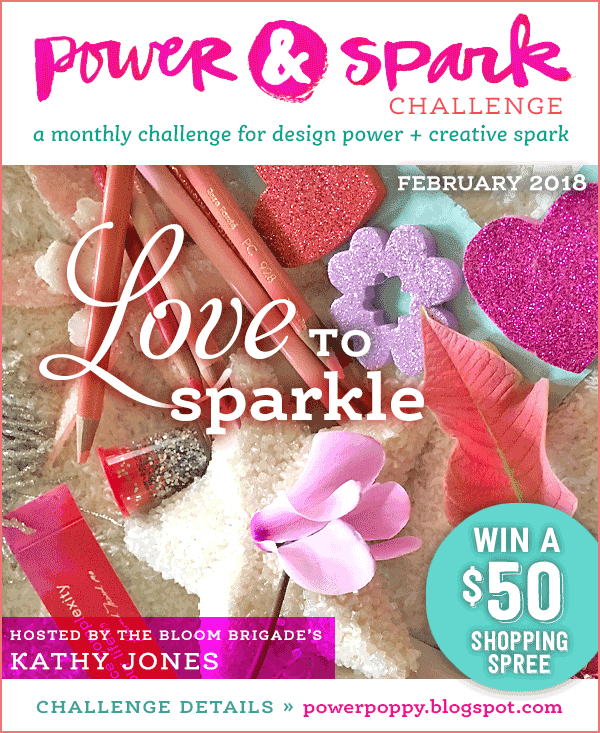 Play along and you could win a $50 shopping spree at Power Poppy! 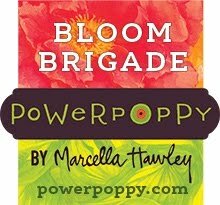 For more lovey inspiration today, be sure to pop by the rest of the Power Poppy Bloom Brigade playing along. So charming Christine!! I have to say...that white hat just stole my heart! LOVE your sweet little pillow box and tag too. You're always so creative and clever!! Christine, your coloring always knocks me off my feet or out of my chair, whatever. Incredibly beautiful and designed to perfection. Christine this is beautiful. So vibrant! I like the red, white and blue feel and your coloring is spot on as always! Awww... what a sweet gift set Christine! The colouring on your roses is beautiful! Love the colour scheme you chose! Thanks SO much, for leaving kind words at my blog :) Much appreciated! This is beautiful, I love the blues and the lovely roses. Were you going to list the colors your used on these?